The Hunt For Red October on VHS. Starring Sean Connery, Alec Baldwin. With Scott Glenn, Sam Neill, James Earl Jones, Gates McFadden, Tim Curry. Directed by John McTiernan. From a Tom Clancy novel. 1990. 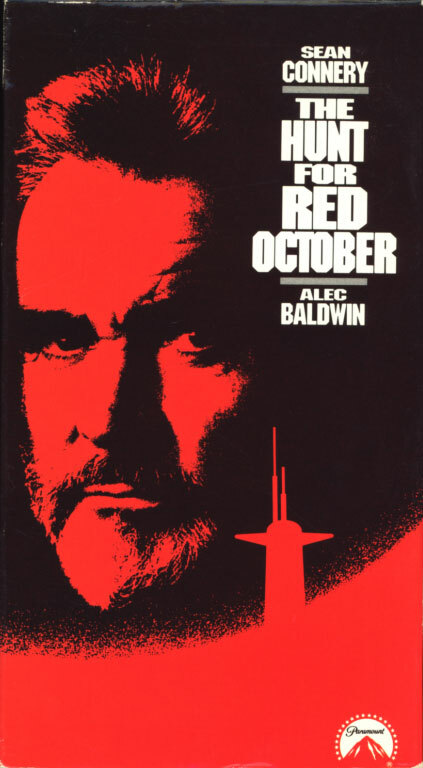 A new, technologically-superior Soviet nuclear sub, the Red October, is heading for the U.S. coast under the command of Captain Marko Ramius (Sean Connery). The American government think Ramius is planning to attack. A lone CIA analyst (Alec Baldwin) has a different idea: he thinks Ramius is planning to defect, but he has only a few hours to find him and prove it–because the entire Russian naval and air commands are trying to find him, too. The hunt is on!